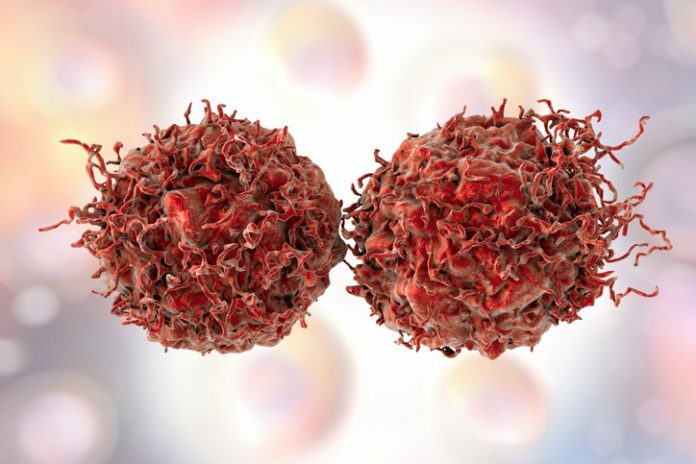 Prostate cancer cells, computer illustration. Scientists in the U.K. and Canada have identified a DNA methylation signature that they claim can distinguish aggressive prostate cancer from more manageable disease, with up to 92% accuracy. The researchers, headed by Norman Maitland, Ph.D., at the University of York’s department of biology, hope that the pattern of 17 epigenetic markers could be used to assess each case of prostate cancer before deciding on whether the patient will need to undergo surgery or radiotherapy, or whether they can be monitored. Treatment-naïve prostate cancer (PCa) is characterized by an abnormal accumulation of proliferating cells that are similar to the luminal cells in normal prostate, the authors write. However, PCa also harbors small numbers of tumor cells with basal features, which display “cancer stem cell” features. These cells appear more likely to be treatment-resistant, and are proposed to serve as the reservoir for tumor recurrence after castration therapy,” the researchers continue. To address this the team carried out genome-wide DNA methylation profiling of separate FACS-purified populations of basal and luminal cells, isolated from more than 500 patient-matched tumor and normal samples. Using a computer algorithm to eliminate the background of methylation patterns that are unique to individuals, the researchers were able to use their comparative approach to home in on cancer-related methylation profiles in each cell type. Importantly, this method made it possible to look specifically at changes in the luminal cell fraction of PCa. The DNA methylation changes in these cells were associated with genes involved in metabolic processes, cell proliferation, and epithelial development, “all functions clearly deregulated in prostate cancer, therefore potentially containing major cancer driver events.” Their results highlighted two different classes of PCa-specific epigenetic changes: “… we were able to identify two separate classes of PCa-specific DNA methylation changes: those specific to cancer luminal cells that can distinguish both normal from cancer samples and organ-confined cancers from those with extraprostatic extensions; those common to basal and luminal cancer cells that are able to distinguish PCa efficiently from normal samples,” the team writes. The researchers are continuing their studies in new cancer samples, and hope to team up with industry to generate a test that could be used with cancer patients in a clinical setting.